The family of an innocent bystander is calling for the Chicago police officer who killed her to be fired. Anthony Jones, the son of Bettie Jones, who was killed by Chicago police Officer Robert Rialmo during a domestic violence call nearly two years ago, said that the policeman should be terminated from the Chicago Police Department. In December 2015, Rialmo fired at a teenager carrying a baseball bat down the stairs of his apartment building. Bettie Jones, 55, was fatally shot when the officer opened fire. The city reached a $16 million out-of-court settlement with Jones’ family. Rialmo said he was reacting to approaching 19-year-old Quintonio LeGrier when he opened fire during a domestic call at LeGrier’s residence. LeGrier died in the incident as well. Anthony Jones said he is appreciative of Chicago police Supt. Eddie Johnson’s decision to fire Rialmo. The Police Board still needs to affirm that decision. 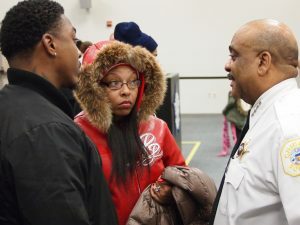 “Since Dec. 26, 2015, our family has been dealing with tremendous heartache and pain,” Anthony Jones said, “but to hear that the city is requesting to fire Mr. Rialmo, we can now move forward with a piece of closure to hold onto in this life sentence of pain that we sustained the day that she was taken from us. Crista Noel, founder of Women’s All Points Bulletin, a nonprofit group that seeks to expose and end police violence against women, including battery, sexual abuse, harassment, assault, fatalities and murders, said the police superintendent made the right decision on Rialmo. Noel said that anyone who gets a copy of the deposition Rialmo gave when the civil case was pending against him and the city will see that the officer lied at least three times. She said that Rialmo even blamed Bettie Jones for being in the wrong place when the shooting took place. “He did not care about shooting her,” Noel said. Chicago resident Tonya Alexander said she was stunned by an encounter she had with Rialmo when police chased her brother to her house. Seeing a sea of police cars and guns drawn in front of her house, she went outside with her daughter to ascertain what was happening.